The Washington Glass School welcomes its new studio coordinator: Robert Kincheloe. Robert has been working with glass since 1997, with a strong background in borosilicate glass. He has studied furnace glassblowing, flameworking, scientific glassblowing, sculpture, murrini, encasements, casting and coldworking. Over the years he has helped to set up several glass studios and has spent the last two years as a studio artist at the Workhouse Arts Center in Lorton, VA.
Robert’s work centers on the use of combining hot, warm and cold glass processes, and he takes a mathematical approach to design. This encourages him to repeat a technique over and over in search of perfecting the logic of the design and controlling its process. 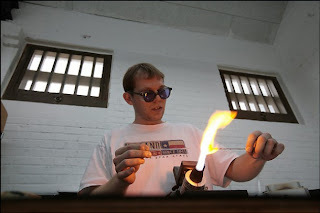 Robert hopes to expand the glass community through his works, classes, demos and lectures, and as such, he will be creating a new series of flameworking borosilicate classes here at the glass school. Robert was part of the Washington Post’s article on the opening of the Workhouse Arts Center in 2008 – click HERE to read the article. Robert at his torch @ Lorton. He has since escaped the former prison. Photo: Dayna Smith for the Washington Post. 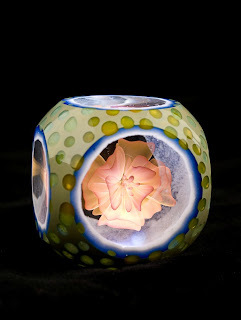 This entry was posted in borosilicate, flamework, lampwork, lorton, robert kincheloe by Michael Janis. Bookmark the permalink.